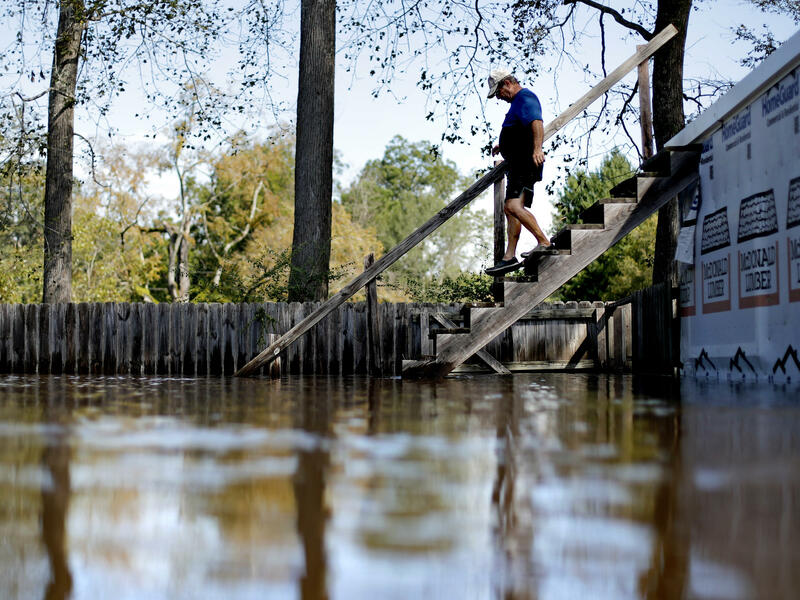 Kenny Babb walks down a staircase on his flooded property as the Little River continues to rise in the aftermath of Hurricane Florence. Coastal residents may have to accept floods as part of life. Water rescues continue. At the Emergency Operations Center in Raleigh, John Dorman with the North Carolina Department of Emergency Management is directing a team calculating flood levels, "then taking those flood elevations and determining if buildings will be flooded and how deep," he explains. They're using a Web-based application called the Flood Inundation Map and Alert Network. "We'll click on this one down here in a town called Burgaw, it's in the Cape Fear River Basin," says Dorman. The database includes where buildings are, their first-floor elevation and how high the water is. It even estimates the cost of the damage. Dorman zooms in on a mobile home in Burgaw. "That mobile home has got about $11,907 damage to it," he says. "But more importantly, it's got 2 feet of water in the mobile home. This really helps out on the response side to know exactly where to go." The same model also shows whether the property is covered by flood insurance. Dorman says early indications are that the majority of the destruction here won't be covered. He says the state has been working to change that and get people to think about insurance and mitigation — taking measures to reduce the risk of a flood. "So that we can live with the rivers and the coast and be more resilient," says Dorman. Resilient is a word you hear a lot during disasters. "We are resilient and we will continue to rebuild," says Amy Cannon, the Cumberland County manager, where the Cape Fear and Little rivers are overflowing their banks. "I think we need to look at mitigation measures in low-lying areas," she says. "And determine how we can mitigate these areas — cleaning out creek beds and streams from debris." For some residents, like Preston Harris of Fayetteville, being resilient means rebuilding time and time again and accepting floods as part of life. "It's just something to deal with when you're living on the river," Harris says. But, experts say, even if people elevate their houses when they rebuild and communities clear out creek beds, those typical mitigation efforts won't be enough in some places. This unprecedented flood is raising questions about what recovery should look like. Gov. Roy Cooper says the experience two years ago with Hurricane Matthew, and now Florence, means it's time to rethink. "When you have two 500-year floods within two years of each other, it's pretty clear it's not a 500-year flood," Cooper says. He says long-range planning will be key. "We will have to look at flooded properties, work on mitigation and buyouts and being smart about how we recover," says Cooper. "Now is the time to start slowly retreating from the shoreline," says Orrin Pilkey, professor emeritus of earth and ocean studies at Duke University. He has written numerous books about living with water and an eroding coast, including Retreat from a Rising Sea: Hard Choices in an Age of Climate Change. He says this kind of "superflood" inland should be a wake-up call. Not all of the communities devastated by Florence should recover. "We have two choices," Pilkey says. "Move back now in a planned fashion or move back later catastrophically." But state law favors property development interests, Pilkey says, and assumes the sea will rise only inches when scientists predict sea level rise measured in feet. There's always tension between rebuilding quickly and a recovery that fosters resiliency, says Elizabeth Albright, assistant professor of the practice of environmental science and policy methods at Duke University's Nicholas School of the Environment. She studies how people and communities respond after extreme flood events and says recovery is not just about where you will live, but how you'll make a living. She believes the future of the rural economy here is at stake. "[The question is] whether or not it's prepared to adapt to a changing climate going into the future," says Albright. "Eastern North Carolina is very resource dependent. Forest, fisheries, agriculture, and I worry very much are we ready for 'the new normal' of more extreme events." Early estimates have the damage from Florence nearing $20 billion, and the crisis is still unfolding. Ahead is a recovery that will be measured in years, not months. There was sun again in North Carolina today. But a catastrophe is still unfolding as rivers rise after days of torrential rains from Hurricane Florence. Water rescues continued for a fifth day. The unprecedented flooding is raising questions about what recovery should look like. NPR's Debbie Elliott has more. DEBBIE ELLIOTT, BYLINE: The sheer scope of the flooding is what North Carolina Governor Roy Cooper calls epic. Just listen as he lists the problem spots. ROY COOPER: The Black, Little, Lumber, Cape Fear and Neuse rivers are inundated with major flooding. And 13 more rivers are forecast to reach major or moderate flood stage. UNIDENTIFIED PERSON: Hey, how long is it going to take you to get to that Target? ELLIOTT: At the emergency operations center in Raleigh, John Dorman with the North Carolina Emergency Management Agency is directing a team calculating flood levels. ELLIOTT: The state has a database that includes where buildings are and how high the water is. It even estimates the cost of damage. DORMAN: That's a mobile home. That mobile home has got about $11,907 of damage to it. But more importantly, it's got 2 feet of water in the mobile home. So this really helps out on the response side to know exactly where to go. ELLIOTT: The same model also shows whether the property is covered by flood insurance. Dorman says early indications are that the majority of the destruction here won't be covered. He says the state has been working to change that and get people to think about insurance and mitigation, taking measures to reduce the risk of a flood. DORMAN: So that we can live with the rivers and the coast and be more resilient. ELLIOTT: Resilient is a word you hear a lot during disasters. But for some residents, like Preston Harris of Fayetteville, it means rebuilding time and time again and accepting floods as part of life. PRESTON HARRIS: It's just something to deal with when you live on the river. ELLIOTT: But experts say, even if people elevate their houses when they rebuild, in some places, it won't be enough. Governor Roy Cooper says the experience two years ago with Hurricane Matthew and now Florence means it's time to rethink. He's even talking about buying out flooded properties. COOPER: We are going to have to be smart about our recovery and about our long-range planning. When you have two 500-year floods within two years of each other, it's pretty clear it's not a 500-year flood. ORRIN PILKEY: Now is the time to start slowly retreating from the shoreline. ELLIOTT: Orrin Pilkey is a professor emeritus of earth and ocean studies at Duke University and has written numerous books about living with water and an eroding coast. He says this kind of superflood inland should be a wake-up call. He says not all of the communities devastated by Florence should recover. PILKEY: So we have to try to move back now in a planned fashion or move back later catastrophically. ELLIOTT: But Pilkey says state law favors property development interests and assumes the sea will rise only inches, when scientists predict sea level rise measured in feet. Duke assistant professor Elizabeth Albright studies how people in communities respond after extreme flood events. She says recovery is not just about where you live but how you'll make a living. Albright says the future of the rural economy here is at stake. ELIZABETH ALBRIGHT: And whether or not it's prepared to adapt to a changing climate going into the future. Eastern North Carolina is very resource dependent - forests, you know, fisheries, agriculture. And I worry very much - are we ready for, you know - quote, unquote - "the new normal" of more extreme events. ELLIOTT: Early estimates have the damage from Florence nearing $20 billion, and the crisis is still unfolding. Ahead is a recovery that will be measured in years, not months. Debbie Elliott, NPR News, Raleigh, N.C. Transcript provided by NPR, Copyright NPR.